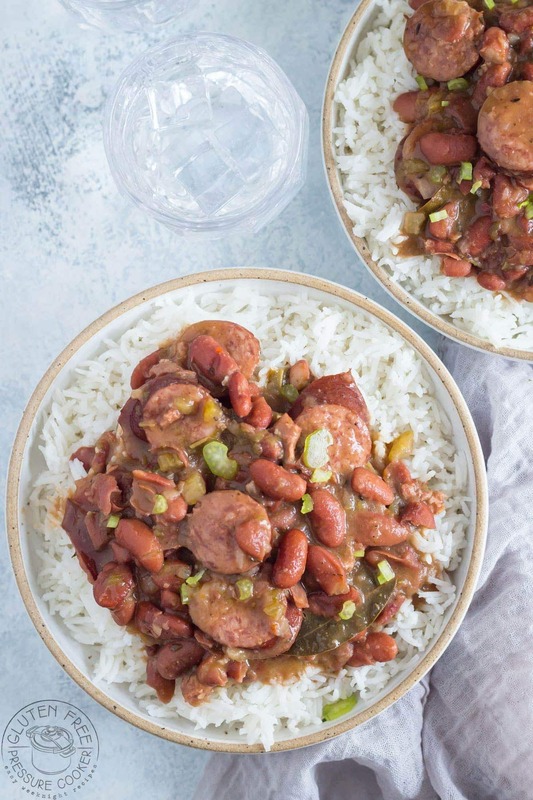 My version of Instant Pot Red Beans and Rice is pretty true to the original which I’m told is actually a Creole dish, but I’ve opted to use Cajun Spices instead and I think they work really well. I’ve also added Andouille Sausage to this recipe as I think it really cranks it up a notch. 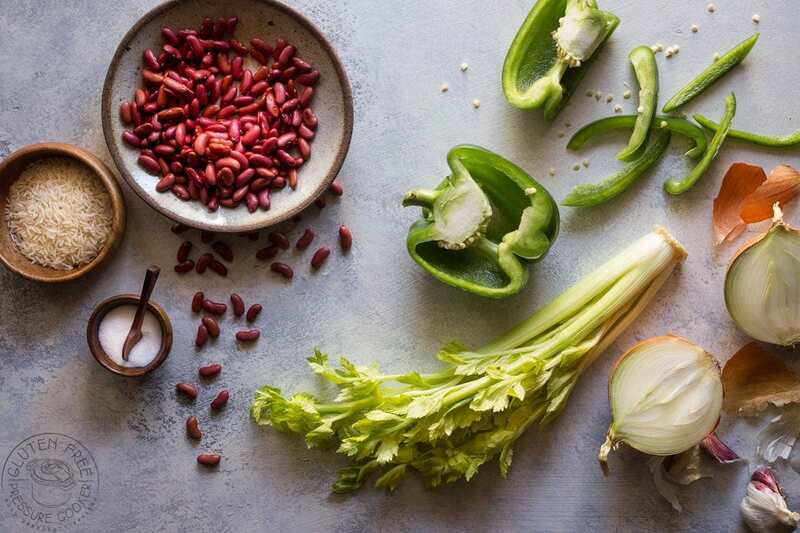 It’s really easy to make a vegan or vegetarian version of this recipe by omitting the sausage and using vegetable stock to cook the red beans with instead of the chicken broth. I’d urge you to plan ahead soak the kidney beans overnight for the best results, I’ve tried quick soaking (see the recipe card) and the results were inconsistent every time with some beans overcooked and others still crunchy. This recipe is made with red kidney beans, not small red beans so just bear that in mind if you choose the small variety as the cook time will be less. If you don’t like Andouille Sausage or can’t find it in your area you can use Kielbasa or a similar ready cooked mild sausage. I used low sodium chicken broth to cook the beans, if yours it not low sodium you may need to decrease the added salt. Is Instant Pot Red Beans and Rice Good For You? Red Beans and Rice is a healthy, nutritious and economical recipe to make. Rice is a starchy carbohydrate and a great source of energy, it also contains iron and vitamin B. Red Kidney beans also have lots of iron and are relatively high in protein. What kind of beans are used for red beans and rice? Traditionally small red beans are used to make red beans and rice, but it’s just as easy to use the bigger red kidney beans as a substitute. I live in Mississippi and it’s easy to find small red beans here, Camellia Brand are the most common. I know that’s not always the case if you live outside the Southern United States so I’ve opted to use red kidney beans for my Instant Pot Red Beans and Rice. No, they may look the same but red beans and kidney beans are actually different varieties of beans. 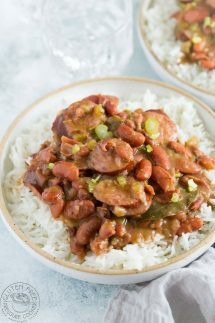 The small red beans that are traditionally used in this recipe are smaller and more round than kidney beans. However, these beans still are very similar and can usually be used interchangeably in most recipes, although the cook times will be different. More Southern Pressure Cooker Recipes! Instant Pot – I have a couple of pressure cookers, but this Instant Pot Duo is the one I’d recommend you get if you don’t already have one! Pyrex Mixing Bowls – I love glass mixing bowls more than plastic as they don’t scratch up and they don’t retain the smell of the food. Instant Pot Replacement Sealing Rings – I have more than one ring for my Instant Pot, I use one for sweet/neutral dishes, and one for savory dishes with a stronger smell. 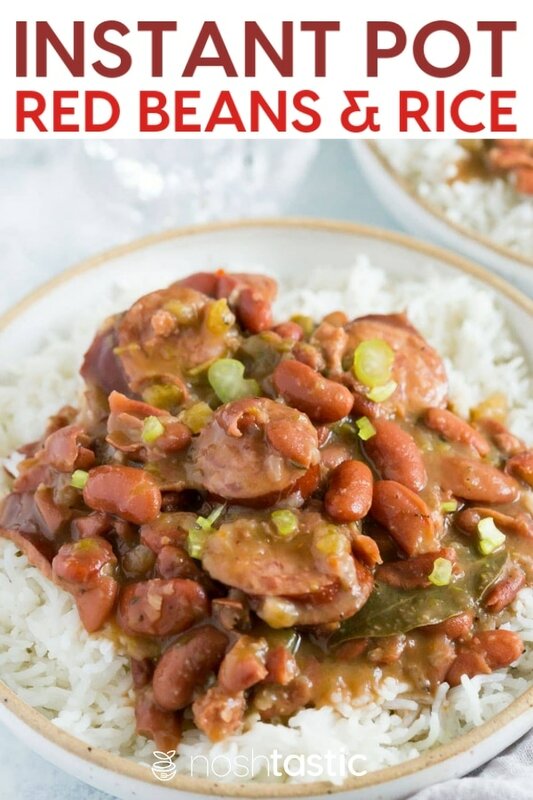 Red Beans and Rice is a perfect recipe to make in your pressure cooker, you'll really love it! Please Read The Recipe Notes Before You Start! For best results use the overnight soaking method, the 'quick soak' will work in a pinch but you may still have beans that are not fully cooked mixed in with beans that are overcooked. Add 1lb of beans to 6 cups of water on the stove and bring to a boil. Then add to your pressure cooker and cook at high pressure for 2 minutes, then quick release the pressure. Throw away the water you cooked the beans in and rinse them, then follow the rest of the recipe as directed. Soak the red kidney beans overnight for 12 hours for best results with this recipe. Add the beans to a large bowl of water and fill it up with double the water to the amount of beans, you can leave it on the counter overnight, you do not need to put it in the fridge. Change the water in the morning if you are not cooking them until the evening. Turn on the saute function in your Instant Pot or pressure cooker and add the oil, cook the sliced Andouille Sausage for about three or four minutes or until it's a little browned on each side, then remove from the pot. Add the celery, onion, and bell pepper and saute for another 3-4 minutes. Turn of the saute function. Add the presoaked (overnight soak preferred) red kidney beans, bay leaves, garlic, cajun seasoning, salt and pepper, thyme and the chicken broth, stir and add the lid. Lock the lid, turn the steam release vent to 'sealing' and using the 'manual' or 'pressure cook' button, adjust it to cook for 7 minutes at High Pressure, then let the pressure fully release naturally, it took up to 20 minutes for the pressure to drop for me. Release the remaining pressure and open the lid. Mash about half the beans with a potato masher and serve hot over already cooked rice. Lock the lid, turn the steam release vent to 'sealing' and using the 'manual' or 'pressure cook' button, adjust it to cook for 15 minutes at High Pressure, then let the pressure release naturally. I have not found a cook time that produces consistent results with quick soaked (or non soaked) beans, in every instant some beans are overcooked and some are undercooked. Lock the lid, turn the steam release vent to 'sealing' and using the 'manual' or 'pressure cook' button, adjust it to cook for 15 minutes at High Pressure, then let the pressure release naturally for about 15 minutes or more. If you find that you still have undercooked beans after 15 minutes then you may need to replace the lid and cook for 5-10 more minutes, or until you get the desired texture. My preferred method is to soak them overnight, It gives the most consistent results. I do have details on how to do a 'quick soak' but I still found that some beans were unevenly cooked. I do not recommend cooking the beans without any kind of soaking beforehand. The cook time for overnight soaked beans means that the sausages will not be overcooked. If you are using un soaked or quick soaked beans then you might want to use a ham hock instead for adding flavor to the beans as the sausage may be soft and overcooked if you extend the cook time, you could then just add the sausage after your beans are cooked.